Written on December 13, 2016 . Posted in Foundation Studies. Mimi Cabell (Assistant Professor, Experimental and Foundation Studies) and her fellow collaborator Phoebe Stubbs are the organizers of Contributors Inc, which was recently published in the current issue of Cabinet Magazine in an article is entitled Cabinet. 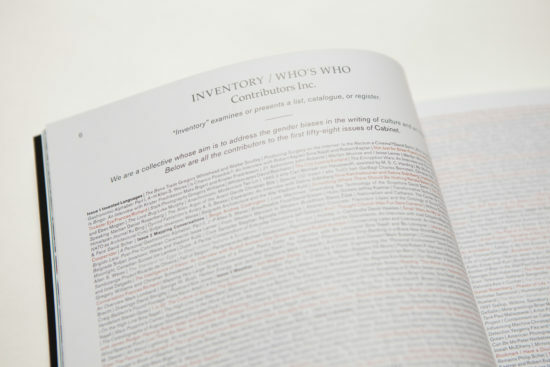 Contributors Inc. is a collective that works with the contents lists in art and culture magazines to highlight the gender imbalance in the contributors to art criticism. Redressing imbalance is often discussed in terms of the visibility of artists, but less in reference to those who create the discourse around art. As a development of this work, the collective has come to see art magazines as both archives of the art world, they constitute its critical history, and sites in which shifting trends based on commercial and political concerns are visible. The method used to construct the article in Cabinet Magazine collected the contributors and contents lists from every issue published of a single magazine and then utilized this textual content to visualize patterns, ideas, and trends as they shift over time.